Summary: We propose a public outreach and education project to address these issues through the distribution of an informational brochure: Attention Beach Users. The brochure will be distributed throughout Florida and beyond. 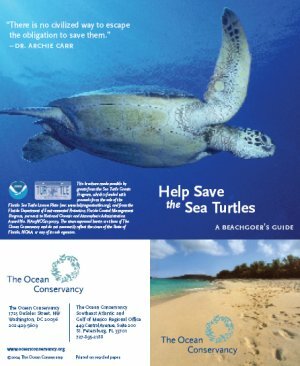 It includes important information on sea turtles as well as information for the public sharing the beaches with sea turtles, dos and donts, and contacts. Biscayne National Park and Miami-Dade Department of Parks and Recreation will be important outlets for these brochures.